In 2016, temperatures soared in the Arctic as hungry polar bears waited for sea ice to form. Species populations plunged worldwide. And a roiling political climate cast doubt on global conservation agreements. But that was last year. A new year brings new optimism, and we’re here to tell you why 2017 is going be a game-changer for the planet (in a good way). Here are 17 conservation gains we are looking forward to in 2017. 1. Canada will protect five per cent of its waters. The government has committed to meeting international targets of five per cent protection by 2017, and 10 per cent by 2020. We’re currently at just over one per cent protection, so we’re ready for the current trickle of marine protection announcements to become a flood. 2. Lancaster Sound will be designated a National Marine Conservation Area. Protecting the “Serengeti of the Arctic” is high on our wishlist. With Shell Canada having relinquished its oil and gas permits in 2016, nothing stands in the way of designating an NMCA in Lancaster Sound using the larger boundary identified by Inuit as including important animal habitat. 3. First-ever assessment of Canada’s watersheds will be completed. WWF-Canada will complete a massive undertaking: the first nationwide assessment of the country’s watersheds. This assessment includes four indicators of health and seven key threats, to create a picture of the state of our freshwater resource. 4. One million Canadians will take meaningful action for nature. We set a goal for Count for Nature and we’re going to hit it in 2017. This will mean a million Canadians will have done more for nature by cleaning shorelines, growing native plants for pollinators, promoting freshwater health for wildlife, constructing nesting boxes for bats and birds, or even climbing the CN Tower. Be one of them this year. 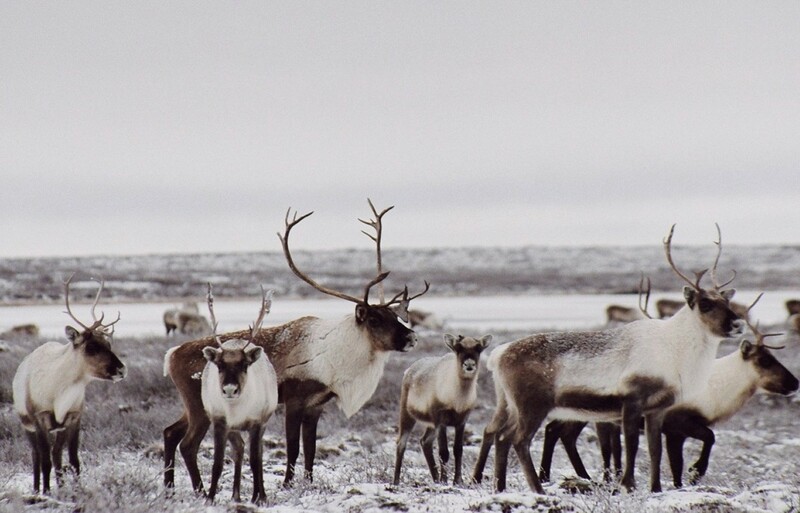 Now that these caribou have been assessed as “threatened,” we’re working to have them designated as such under the Species At Risk Act (SARA), to be announced in fall 2017. Although that may not sound like a good thing for these declining herds, SARA designation will trigger the development of a Canada-wide recovery plan. 6. Canada will take steps toward becoming a clean energy superpower. Around the world, communities and industry are embracing the power of clean energy. Canada has enormous energy potential beyond fossil fuels. Our habitat-friendly Renewables for Nature tool, expanding in 2017 to include Atlantic Canada and Alberta, will help speed the transition by showing where clean energy resources exist with the least conflict with nature. 7. Canada and the U.S. will start to reverse 50 years of degradation in the St. Lawrence River and Lake Ontario. Thanks to Plan 2014, which was signed in December 2016, 2017 will see the start of the biggest natural aquatic ecosystem restoration project in Canada. Great news for wetlands and species. 8. One thousand Canadian companies will be a part of Living Planet @ Work. Companies that join Living Planet @ Work champion sustainability in the workplace and make decisions that boost nature as well as the bottom line. Our program will be the biggest ever in 2017. 9. Portions of the Last Ice Area will make Canada’s tentative list for designation as a UNESCO World Heritage Site. The UNESCO designation process is long, but we’re hoping the natural and cultural value of sea ice will get a boost just by getting on to the long list next year. 10. Humans will get real on climate change. The Paris Agreement, a global agreement intended to curb greenhouse gas emissions and mitigate the effects of climate change, went into effect on Nov. 4, 2016. In 2017, countries need to get serious. We’re betting on action on renewable energy and downsizing Canada’s big eco-footprint. 11. Accountants will save the planet. We are spending down Earth’s natural capital. Human activities are hurting nature’s ability to provide fresh water, clean air, pollination, steady weather – all essential ecosystems services for biodiversity and a healthy economy. Metrics that incorporate the value of nature into decision making are in the works; this Accounting for Nature toolkit will get businesses started. 12. Ships won’t be allowed to dump grey water in the fragile Arctic. Federal regulations on grey water — that’s the discharge from the sinks, showers and galleys on ships — are in desperate need of an overhaul. WWF-Canada is optimistic that in 2017, Transport Canada will close the gaping loophole in its grey water regulations between northern and southern Canada, and adopt stiffer rules similar to those in place in Alaska. 13. Salish Sea orcas will get a meaningful recovery plan. The 79 orcas of the Salish Sea are teetering on the brink of survival. Six of them died in 2016, and the federal government released a long-awaited proposed action plan for their recovery. The final plan has yet to be released. We’re hoping it comes early in 2017, and contains tough measures to immediately reduce threats against this endangered population. These orcas need help, and fast. 14. Feds will fund renewable energy for the Arctic. Diesel fuel is the primary energy source for remote Arctic communities, but it negatively impacts the environment. Following the United States-Canada Joint Arctic Leaders’ Statement, we’re optimistic that money will be allocated in the 2017 federal budget to deploy renewable energy in the North. It’s reliable, affordable and good for both the environment and communities. 15. We will celebrate 25 years of northern cod recovery. 16. Young Canadians will become freshwater champions. Our freshwater team will be taking our healthy waters message to young people across the country, creating the next generation of water leaders. Our work is only possible thanks to your support. Together, we’ll continue to make important gains for wildlife and for the planet. Enjoyed reading about hopes and dreams for 2017? Sign up for email updates to stay informed this year as they actually come true.